Welcome to TSRI's Summer Grilling Celebration! We are so excited about summer and the thought of charcoal and barbeque grills, caramelized grill marks on meat, fruit and veggies!!! Our home has had lingering smells of barbeque in the air and an empty menu planner filled with nothing but possibilities! Until now. We have been developing and testing the most scrumptious recipes. We are going to be sharing some of our favorite grilling and summer treats in the coming weeks. We will be enjoying TSRI's Grilling Summer Celebration until June 18th when we will begin our one year anniversary celebration with another amazing giveaway. Make sure you keep checking back. Today we bring you the family favorite. Not your usual grilled chicken. I am not kidding when I tell you that I have made this recipe 6 times already and have never been able to get a shot of it. By the time the chicken came off the grill we could not control ourselves. We would dive right in. This recipe is perfect just the way it is. With one possible and I mean possible change. Chad loves this marinade so much that would like me to double the recipe so he can have it as a dipping sauce too. Well, if that is a critique, bring it on. This recipe is a member of the clean plate club!! Add rosemary, lemon juice and zest, garlic, olive oil, salt and pepper to your food processor. I have a mini food processor that works great for this (ok it is a magic bullet and I love this thing for these little jobs). Process until smooth. Marinade makes approximately 1 cup. Place chicken in a 1 gallon resealable bag, add ¾ cup marinade and seal bag. Rub the chicken with the marinade to make sure it covering all the chicken. Place the chicken in the refrigerator overnight (I have made this recipe and marinated for as little as 30 minutes and as long as 2 days. Overnight is just perfect). Turn the chicken occasionally. Prepare the barbecue for medium-high heat or preheat a grill pan over medium-high heat (I personally like to use a table top grill). Remove chicken from the marinade. Discard the marinade. Grill the chicken until just cooked through, about 8 minutes per side. After turning the chicken, use the remaining 1/4 cup of marinade to baste the cooked chicken. Transfer the chicken to serving plates. Serve with a wedge of lemon. Enjoy! Yum, this sounds delicious - I do something similar in the oven but haven't' tried it on the girl. Your's looks wonderful. Thanks Chris! I am sure this would be amazing in the oven too. 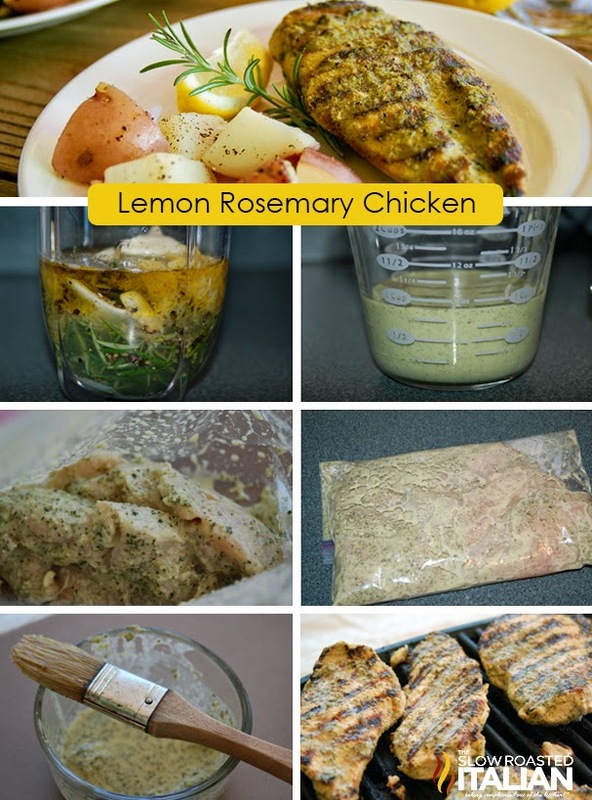 I love lemon and rosemary on chicken. Congrats to the lucky winners!! I bet this is so good, and love the "extra sauce for dipping" idea. Can't wait for more grilled recipes. Can't wait to grill more chicken myself! Have a terrific week. This sounds amazing! 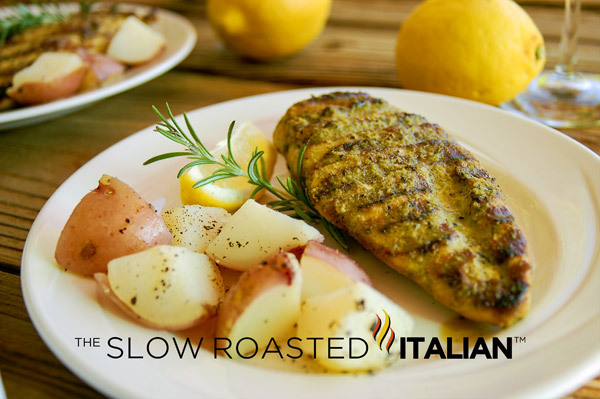 I've made roasted chicken before with a lemon garlic rosemary rub (not processed though) and it was delicious so I can't wait to try this on grilled chicken -- think I'll use chicken thighs! I am sure it will be amazing on chicken thighs! All that extra flavor. Let me know your thoughts when you make it! Another fabulous recipe fit for a festive occasion. I would love to serve this for my in laws this weekend. I am sure hubby will be proud of me. =) And my folks will love this, I bet! I am excited to hear back. Let me know how it goes for you! We sure love it! Potatoes and green beans are our favorite side dishes with this. Have a fantastic weekend with your in-laws! I'm confused, looking at the photos it looks like there should be another ingredient that makes it so white, am I missing something? Breigh, the olive oil forms an emulsion. It is actually more of a green tint though from the rosemary, you can see the actual color in the measuring cup picture. Oh great, thanks! I keep looking at the photos and thinking "I'm sure I see a pile of white stuff in there at the back!" haha I can't wait to try this! I hope the recipe worked out for you. I was going to suggest 350. Let me know how it worked out. Is it ok if you dont blend it? I skipped that part on accident! Absolutely, I have made it many times without blending it and it is awesome! Enjoy and let us know how it goes. These look fantastic! Many thanks for post. Awesome recipe. Have a nice day! Made this 4 times already and each time it was amazing. This last time I made it with half orange zest/juice because I didn't realize I didn't have enough lemons until after I started cooking. I'm not sure which way I like better! The lemon is delicous but the orange makes it just a little less sour. Both fruit flavors are easily distinguishable and neither one is overpowering.